EZ Pool Chemical is unlike any other chemical available This all-in-one chemical system oxidizes, prevents algae, and gives you a crystal clear swimming pool all season long. 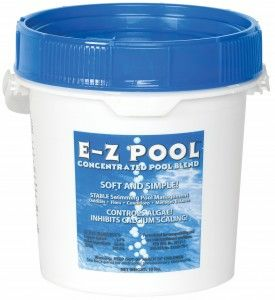 EZ Pool is a compound powder that is easy to manage and add into your pool. E-Z pool chemicals is used with your chlorine, mineral, salt, or ozone pool systems. Add EZ Pool to your water once a week. EZ Pool was created to last 7-10 days in most pools. EZ Pool chemicals will not irritate your skin or eyes. Chemicals will not fade your suits, hair, or equipment. E-Z POOL� offers a No Algae Guarantee! The program is simple: In the unlikely event a pool using E-Z POOL� gets algae, we will cover the cost to eliminate it! *Limited to reimbursement to dealer for cost of chlorine shock only to eliminate algae in a residential swimming pool. Requires verification of the E-Z POOL� Startup program and proper application/dosage of E-Z POOL� with a documented water test from an authorized dealer (proper water balance, chlorine minimum 1.0 and phosphates under 250 ppm).